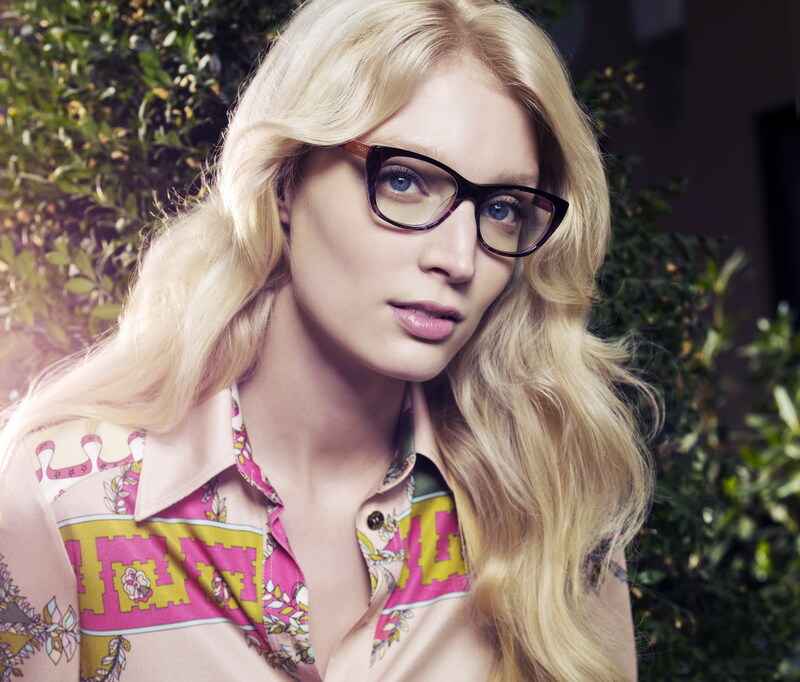 The Emilio Pucci glasses label embodies European sophistication and beauty. It is known for offering designs that flirt with bold colors and eye-catching patterns. In addition to being visually stunning, designs by Emilio Pucci are pleasing to the touch and extremely resilient. This Italian label consistently releases some of the best glasses each season. Emilio Pucci glasses should be on your radar if you’re looking for new frames that can make you look ready for the runway in everyday life. Emilio Pucci was a fashion designer from Florence, Italy. His impeccable taste was crafted by the exposure to the Italian art scene he received as a member of one of Florence’s noble families. The Emilio Pucci fashion empire was born when the designer began creating uniforms for college sports teams. He was soon creating unique designs for influential female friends throughout Europe. Pucci received widespread attention after people began noticing his brilliant work with experimenting with stretch fabrics. He soon became a household name among fashion lovers because of his unique use of colors and textures. Emilio Pucci’s designs have been draped over stars like Sophia Loren, Jackie Kennedy and Madonna. The Pucci label continued to thrive after Emilio’s death in 1992. It expanded to include a line of accessories that capture the elegant essence of Pucci’s fabric work. The are Pucci boutiques in New York City, Las Vegas, Beverly Hills, Boston and East Hampton. The brand’s designer glasses can also be ordered online by people looking for high-quality, gorgeous frames that stand apart from all others. Emilio Pucci frames are beloved by people around the globe because they offer so much glamour and sophistication. It is easy to feel like you’re walking along a beach in Capri or enjoying a getaway in Paris as soon as you slip designer glasses from this label over your eyes. One thing that is notable about the Pucci label is that it manages to stay current while always remaining true to the classic looks that helped the brand rise to fame decades ago. People know they are receiving a product made from quality materials and impeccable craftsmanship when they choose a Pucci eyewear design. Who Wears Emilio Pucci Over Their Eyes? The Emilio Pucci brand is simply one of those labels that never goes out of style in Hollywood or mainstream circles. The same classic glasses that attract a sophisticated woman will also catch the eye of a young lady looking for a way to accessorize with luxury. It can’t be denied that the label attracts mature customers looking for practical eyewear options. The classic and crisp designs offered by the brand are ideal for the workplace and everyday life. In addition, many younger customers are now discovering Emilio Pucci glasses as they look for designs that will help them transition from fashion eyewear to cute glasses with substance. The Emilio Pucci label definitely has a permanent home in the hearts of Hollywood’s sophisticated women. 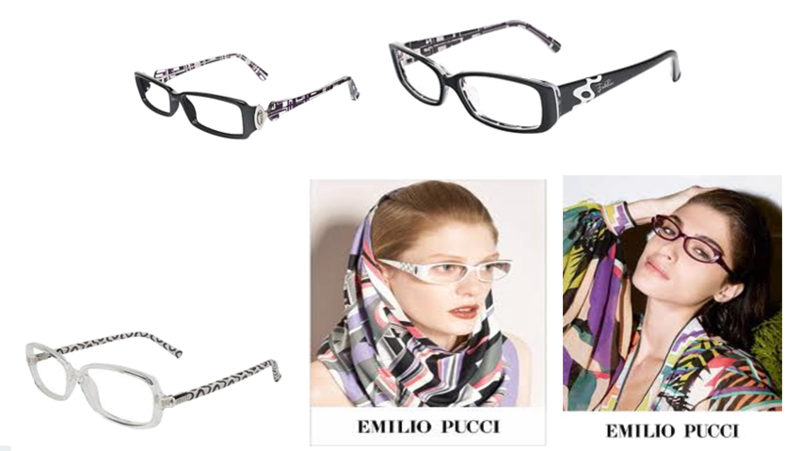 In fact, nearly every style icon of the recent era has been photographed in Emilio Pucci frames. Lady Gaga, Mandy Moore, Kristen Stewart, Leighton Meester and Oprah Winfrey have all been spotted looking lovely in striking frames from the label. You should expect the unexpected from Emilio Pucci. The wonderful thing about the label’s eyewear collection is that it offers such a diverse mix of frames. You can opt to go bold and futuristic or studious and classic when you shop from the current collection. You truly have the freedom to go as experimental or conservative as you please when you put Pucci over your eyes. Of course, some features are universal when it comes to Emilio Pucci glasses. You can expect rich, shiny textures that look like liquid velvet. You’ll also be mesmerized by the brand’s use of clean, sharp lines to define its frames. What’s really fun about picking out cute glasses from the Emilio Pucci line is that you’ll be free to choose just about any shape you can imagine. This brand offers square, rectangle, round, aviator and cat-eye designs. Of course, each shape comes available in a variety of styles with unique accents. Little accents and embellishments turn classic designs into extraordinary fashion statements. The designers behind the Emilio Pucci label are masters at creating colors and textures that blend timeless looks with modern trends. There are many muted color combinations and kaleidoscope-inspired patterns to choose from as you’re shopping for the best glasses for your needs. Share with us and our thousands of readers in the comment sections below of your favorite Emilio Pucci glasses and tell us the story of how you found them and what inspired you! This entry was posted in Emilio Pucci Glasses, Uncategorized and tagged Buying Prescription Glasses Online, cool glasses, cute glasses, designer glasses, Emilio Pucci Glasses, glasses styles. Bookmark the permalink.